Make your own FNCA Polar Bear plushie! Woof" Woofenden sometime in the 1990s. 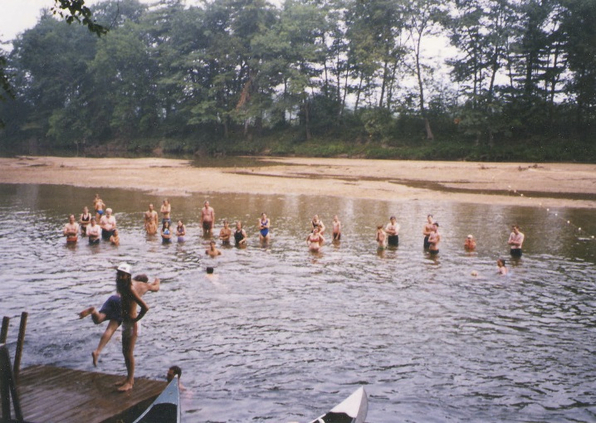 First, a little history: Most campers from the 1960's and 1970's remember a daily morning dip before breakfast. Some campers from the 1940's and 1950's have vivid memories of seeing Mrs. Foster (mother of Ted) going down to the river for a brisk swim every morning at 6:00. 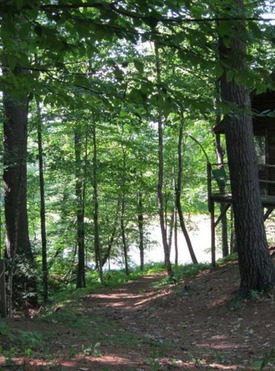 Other old-timers remember campers swimming before breakfast as far back as the 1930's. The earliest known record of what became known as Polar Bear Swim, however, is in 1928, the year we bought our first 12 acres near the State Line. Over the years, enough joined in that it has bocame a daily camp tradition that continues to this day. Each morning at the rising bell, the FNCA Polar Bear Club gets together for a pre-breakfast dip in the refreshing and invigorating waters of the Saco River. Everyone gathers at the top of the path to the river awaiting the arrival of our leader who greets the group with a hearty, "Good morning, Polar Bears! ", to which the group responds with a mighty, "Good morning, Papa Bear!" © Jesse White 2011Someone checks the Polar Bear thermometer above our official FNCA Polar Bear Club sign on the side of the Tool Shed next to where we gather, and then we head down the path to the river for our morning swim. 1. You have to go in willingly. 2. You have to swim at least one stroke. chalkboard in the Dining Hall. The first one in is the "Icebreaker"! After that, one by one or in clusters, everyone enters the water in their own style. While most people swim across and wait on the other side for the rest of the group to join them, a few are either in too much of a rush or are not quite that intrepid and climb down the ladder, let go for the required one stroke, and quickly climb right back up out again! This maneuver is known as "a Beki", named for it's originator Beki Greenwood. As swimmers dive, jump, or climb into the water, Papa Bear stands on the bank and keeps a loud count of the number of Polar Bears who have gone in so far. Finally, Papa Bear himself dives in, swims across and, joining the others, announces the final number from the shallows on the other side. Next we all sing a rousing rendition of the Polar Bear Song together before swimming back across, where we all grab our towels and head back up the path for a quick hot shower and/or a pause to warm up in front of the fireplace in the Main Building before getting dressed for breakfast. Ross Woofenden in 2016.The morning ritual officially ends during announcements at breakfast when Papa Bear announces the day's Polar Bear Quotient as he enters it on the official Polar Bear chalk board to either oohs and ahhs or moans and groans depending on if the PBQ is low (good) or high (bad). What is the Polar Bear Quotient, you might ask? Well let me tell you: It was created by the Rev. Dr. George F. Dole in 1989 as a method (to quote the Polar Bear official records book) "to numerically evaluate the influence of temperature on the number of Polar Bears on a particular morning. 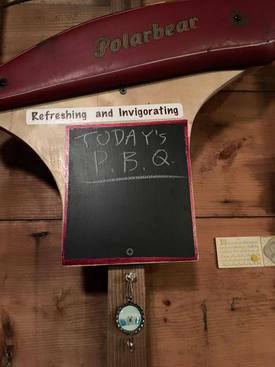 ...You take the air temperature at the rising bell, subtract 32 to get the number of degrees above freezing, and then simply divide by the number of Polar Bears to get the day's PBQ." 4. the signatures of the year's Polar Bears. There are a few figures and some signatures missing from the four earliest years of record keeping; the rest of the years all have complete data and (presumably) signatures. These statistics are all kept in the official Polar Bear Club book which was obtained in 1993 for that purpose and is maintained by Papa Bear. 1998 NOTE: Friday of first week, the Polar Bear Club set an all-time high record of 41 Polar Bears and an all-time low PBQ of 0.87, just barely beating out Monday of second week in 1994's PBQ of 0.88! "On the Way to the New Polar Bear Record!" 2003 NOTES: A Polar Bear Club FIRST happened opening Sunday: We fished a message in a bottle floating by out of the river. Papa Bear wrote a letter to the sender, inviting her to join us... and she did! 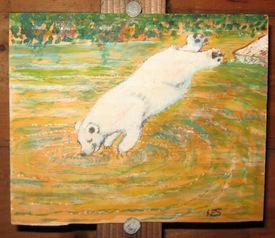 She and her mother showed up for Polar Bear Swim one morning second week! We invited them to stay for breakfast and they got a huge, rousing round of applause from the entire camp during morning announcements! 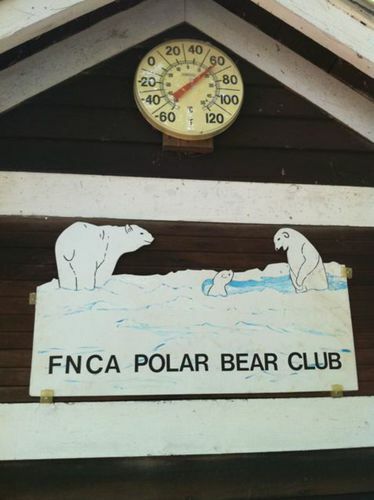 Another Polar Bear Club FIRST happened Thursday of first week: For safety reasons due to extremely high and extremely swift water, the camp director cancelled Polar Bear Swim for the only time in recorded FNCA Polar Bear Club history! 2004 NOTE: A Polar Bear Club FIRST: On Thursday of first week, a moose crossed the river down at the bend while we were singing the Polar Bear song! 2005 NOTE: A Polar Bear Club FIRST: On Wednesday of first week, we were joined by a snapping turtle that swam through the swimming area in the middle of Polar Bear Swim! 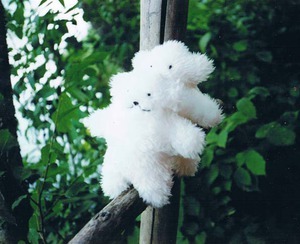 © Nancy F. Little 1998The FNCA Polar Bear plushie was created by Louise Dole "Mom Woof" Woofenden in the 1990s. They were made of white fuzzy material, and were a big hit on the Sales Table that year, completely selling out within a few days. She made more the next year, and those very quickly all sold out, too. 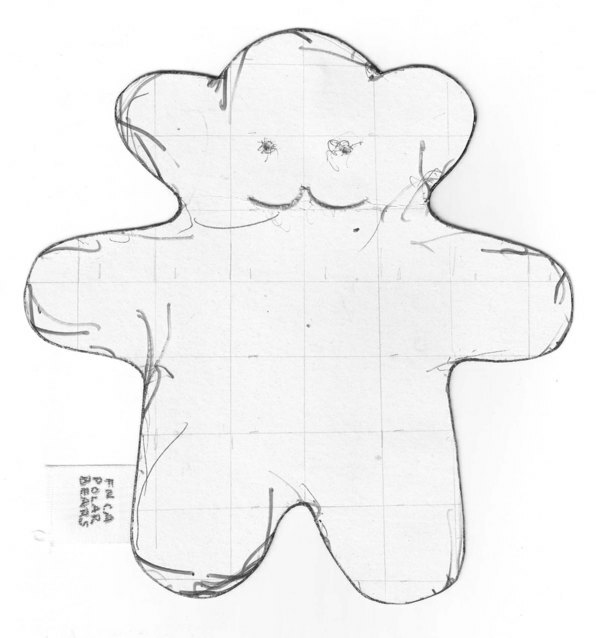 The pattern above is a scan of Mom Woof's original pattern. Due to the maximum size photo we can put on the website, it is a bit smaller than the actual size — which is 7" tall — so enlargen it to that size if you want to match the originals. 1. Find some white fuzzy material. 2. Cut two identical pieces of the pattern adding about 3/8" for the seam. 3. Embroider the face on one with black thread or embroidery floss. 4. Place the two pieces together with the fuzzy sides facing each other and sew them up leaving an inch or so unsewn on the outside of one leg. 6. Carefully handsew the stuffing hole closed. NOTE: If you decide to include the tag that's on the leg in the pattern, it's just a piece of wide bias binding or heavy white material folded in half and written on with a black marker. It goes in the stuffing hole in the leg when you sew it up. Now you get to enjoy your new FNCA Polar Bear!